The apartments in Cala Gonone – Sardinia (Italy) are a fully furnished very high standard two bedroom, balcony with sea and mountain view apartments. The flats are distributed in two floors, entirely self catering and it comes complete with a secure parking space. There are one bathroom and fully fitted modern kitchen/living room. 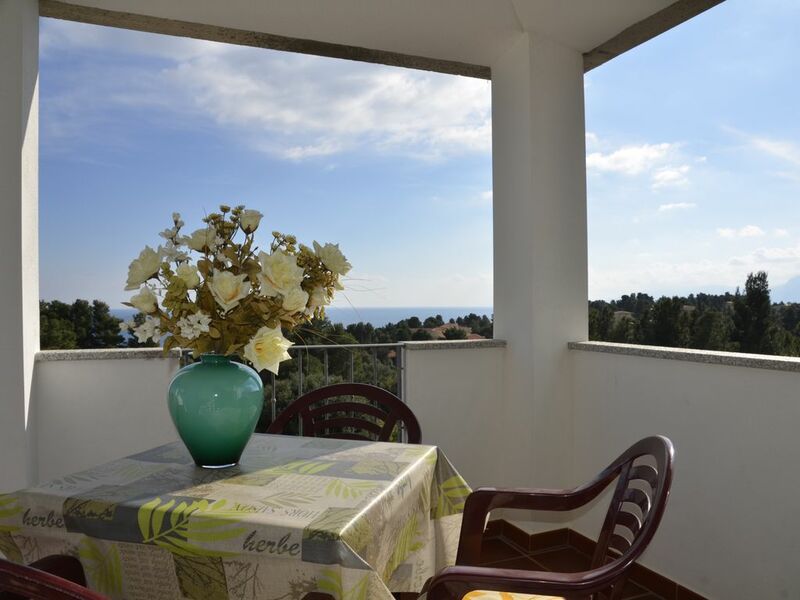 The main feature of this apartment is the balcony giving you extensive harbor and sea views. In the building, there is a common laundry with coin washing machines. Children up to three years old do not pay. Beaches are 10 minutes walking. The price includes the consumption of water and gas. Electric consumptions, to be payed before leaving, measured through a dedicated device installed on the apartment. The village is immersed in the “macchia mediterranea” consisting of densely-growing evergreen shrubs such as sage, juniper and myrtle. His coastlines is one of the most uncontaminated in the Mediterranean, extending over 40km, within the Orosei Gulf. The beaches – Cala Luna, Cala Sisine and Cala Mariolu – are among of the most beautiful in the Mediterranean, interrupted only by coastal towers and harsh limestone cliffs. The countryside offers a towering range of mountains and valleys, where it is possible to visit several local monuments, like “Fairies’ houses”, “giants’ tombs” and dolmen testify to the deep religiosity of the ancient inhabitants of this land. In Cala gonone visitors can find a sea, sun, caves, excursions into undiscovered nature, hospitality, folklore, archaeology. This apartment was clean and spacious,however, lacked a few essentials such as toilet roll, dish towels and a living room area as described on the listing. On arrival we were asked to pay a cleaning fee which is not stated in the listing which sadly left us a slightly annoyed and nor was there any ‘pantry items’ which is stated in the listing. The owners are very welcoming and offered very good dinner recommendations and we thoroughly enjoyed eating breakfast on the balcony (lovely views) every morning with the sun shining. Great Apartment, perfect equipment. Thank you. Appartamento dove non manca niente, bell'edificio. Bellissima vista alberi e mare sul terrazzo davanti e rocce sul retro! Francesca gentile e disponibile. A inzio giugno molto tranquillo. Die Wohnung, in der wir für eine Woche zu Gast waren, liegt in der obersten Etage eines Gebäudes mit mehreren Appartements. Dadurch hat man vom überdachten Balkon einen schönen Blick aufs Meer. Der Abstand von den größeren Durchgangsstraßen ist recht groß, so dass man vom Verkehr nur wenig mitbekommt. Die Wohnung selbst ist mit allem Nötigen ausgestattet und machte einen gepflegten und sauberen Eindruck. Nur der Fernseher ist lächerlich klein. Dafür gibt's W-Lan. Durch die Fließenböden und die sehr hohen Räume ist die Akustik etwas gewöhnungsbedürftig. Insgesamt kann ich die Wohnung auf jeden Fall weiterempfehlen. Spacious and clean apartment with seaview! Great location, lovely owners and fully equiped, clean apartment. Good value for money! •	May: Fish festival, with tasting of Dorgalese traditional products. •	15th August: the Feast of the Assumption is a procession in magnificent local costumes. •	Autumn: Cortes Apertas, where it is possible to visit the oldest courtyard of the village with the exposition of traditional and rural instruments. Tariffe scontate in relazione alla durata e in funzione del numero di persone, Deposito cauzionale, Caparra richiesta alla prenotazione, Spese di 30€ per pulizia finale. Il prezzo su indicato è riferito a due persone ed include i consumi di acqua e gas. I consumi elettrici verranno misurati attraverso un contatore installato all'interno dell'appartamento e verranno pagati prima della partenza. Consegna delle chiavi da parte del Proprietario.